Sen. Tom Tiffany (R-Hazelhurst) at the Senate Committee on Workforce Development, Forestry, Mining and Revenue. 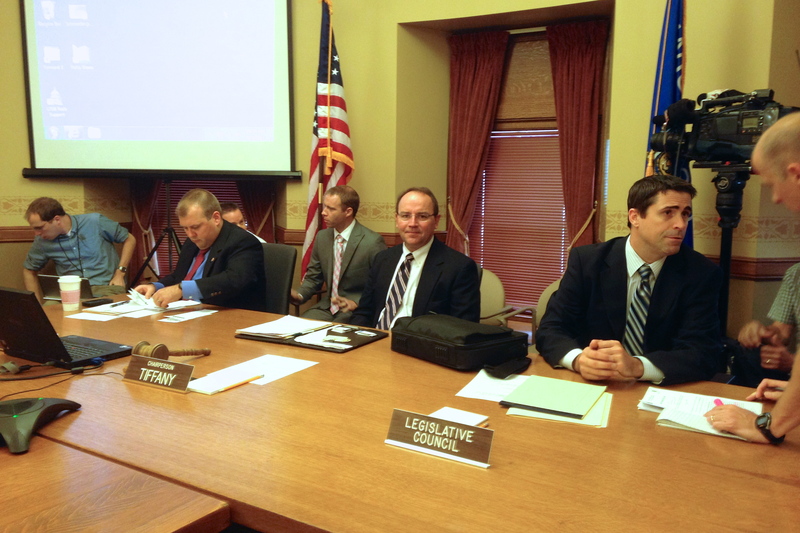 The Wisconsin State Senate Committee for Workforce Development, Forestry, Mining and Revenue passed SB 278 on a party line vote this morning. The bill allows Gogebic Taconite to close off 3,500 acres of Managed Forest Land for public access immediately upon enactment of the law without paying the withdrawal fees they would otherwise have to pay under current law. But the committee chair and the Capitol Police showed contempt for the public during the proceedings this morning. Access to land wasn’t the only thing blocked: Members of the public were temporarily prevented from entering the meeting room by Capitol Police officers, and a journalist was barred from filming inside the session by Senate staff. Despite a state statute that says that during open sessions of legislative meetings “the body shall make a reasonable effort to accommodate any person desiring to record, film or photograph the meeting,” videographer Nicole Desautels was ordered to turn off her video camera at the beginning of the session. “I’ve been documenting events in the Capitol for 2 1/2 years, mostly for my youtube channel, LadyForward, and for the Wisconsin Citizens Media Co-op. The Progressive magazine website picks up my work on occasion as well,” says Desautels. Katherine Bauer traveled to Madison from Menasha yesterday to give testimony at the public hearing. At the end of the hearing she asked committee chair Sen. Tom Tiffany whether the executive session would be open or closed. He assured her that it would be an open session multiple times. Bauer arrived at the meeting room this morning to find two Capitol Police officers blocking the door. When she tried to enter she was told by Officer Steingraeber that it was a closed meeting. She insisted that Sen. Tiffany told her it was open, and finally a Senate staffer came out of the room to confirm the fact and they were allowed to enter. They were the only members of the public in the room. Desautels and Bauer both filed incident reports with the Capitol Police. Why don’t Wisconsin’s Capitol Police do something useful for a change and arrest the lawmakers, the Walker administration officials, *and* their own officers who are brazenly violating Wisconsin law? The update is SCATHING. Thank you for capturing it and for posting it. I will share widely.